Add a stability challenge to your boot camp. Boot camps are everywhere, and there’s something for everyone. If your students are looking for the challenge of a boot camp with additional focus on stability training, try Core Conditioning Camp. This class includes powerful calorie-burning cardio moves and unique strength training exercises, with an emphasis on balance training to challenge the core. Plan for smooth transitions so that one exercise flows into the next. For example, flow from a squat-thrust exercise to a set of push-ups. Sequence the class as intervals, alternating cardio and strength. Use strength exercises as active recovery. Choose moves that use multiple muscle groups and that require core stabilization. Add instability by balancing on one leg, by utilizing unsupported forward hip flexion or by adding unilateral movements with weight. Offer options for all levels by adjusting the number of repetitions, by changing lever length or by adding contact points. Use the warm-up to preview some of the movements and to introduce neutral posture and core stabilization. Incorporate large muscle groups to increase body temperature and heart rate. Complete 8 reps of each of the following exercises, and then cycle through the sequence 3 more times (for a total of 32 reps per exercise). Squat, single tempo; reach arms up when standing. Squat-thrust with hands on end of bench. Push-up: right (R) hand on bench and left (L) hand on floor (knees down). Push-up: L hand on bench and R hand on floor (knees down). Plank with both hands on bench: step one leg forward to low lunge; alternate sides. Using a step bench in the vertical position, perform 8–12 reps of the following moves. Squat-thrust. Squat down, bring hands to bench, hop back to plank, straddle bench with hands (R, L). Bring hands back to top of bench, hop forward and stand. Push-up. Perform with hands wide, straddling bench (use reduced range of motion). Cardiovascular conditioning. Begin in plank position with hands on bench. Hop forward to squat, hop up in air (reach arms overhead), squat with hands on bench, hop back to plank. Repeat sequence on other side. Squat-thrust. Squat down, bring hands to bench, hop back to plank, take R hand to floor, do one push-up, bring R hand back to bench, hop in and stand. Push-up. Perform with L hand on bench, R hand off. Cardiovascular conditioning. Squat, hop to top of bench and return to squat on floor. Squat-thrust.Squat down, bring hands to bench, hop back to plank, take R hand to floor, open to side plank (L hand up), return to plank. Bring R hand back to bench, hop in and stand. Push-up. Superman style: alternate push-up (hands straddle bench) with back extension while lying prone on bench. Cardiovascular conditioning. Begin in plank position with hands on bench. Hop forward to squat, jump up and land on top of bench. Hop down to floor with hands on bench and hop back to plank. Alignment tip. Maintain neutral spine during squat-thrusts and push-ups. Beginner’s tip. For less intensity, step back instead of jumping back on squat-thrusts. Perform push-ups from knees. Complete 8–12 reps of each exercise. Upper-body strength. Hold weighted bar in R arm and perform row while moving into warrior 3 (balance on L leg and extend R leg parallel to floor). Cardiovascular conditioning. While performing slow jumping jack, hold bar in front of hips. Place bar on bench and pick it up as you move with good form. Upper-body strength.Do rear lunge with biceps curl (left leg steps back). Cardiovascular conditioning. Do speed skater move (side-step with leap) with bar safely placed on upper back. Upper-body strength.Perform stationary lunge, R leg forward, and add overhead triceps extension with bar. Cardiovascular conditioning. Do squats with bar across bench; pick up and put down bar (hop between reps). Alignment tip. Maintain neutral spine and hinge from hips when picking up weighted bar. Beginner’s tip. Reduce range of motion and eliminate jumps. Give participants a much-deserved break from the workout’s intensity by teaching a silent standing stretch. Lead them through a series of flexibility exercises, having them focus on their breath. Stretch all major muscle groups used in the workout for 30 seconds each. 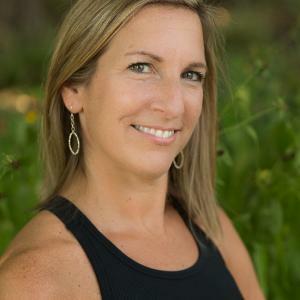 I am owner of Flow Fitness Training and provide AFAA and ACE approved continuing education programs for fitness instructors, specializing in strength training, stability training, functional fitness, and interval training. I am a National Master Trainer for BOSU. I have been teaching fitness for 20 years and love helping my students to be fit and healthy. I also truly enjoy sharing my knowledge with other fitness professionals. ... read more.